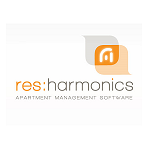 Rerum from res:harmonics was built from the ground up as a web based apartment management platform for serviced apartment companies. It was not adapted from a desktop app to work on the web or from a hotel management system to work with apartments, day 1 this was built for a business like yours. As a result, it’s smarter than any other PMS on the market, it automates hundreds of customer communication tasks, it helps drive revenue growth and provides you with key metrics to help you run and grow your business.